Last month my hometown made the news—but not for a good reason. But with all the recent tragedies both man-made and natural, you might not have heard about it, but you can read about it here. In ‘news’ terms, it wasn’t a huge spill, but as someone living the area, no spill is a good spill. One of the reasons I love living where I do is because of its incredible natural beauty. 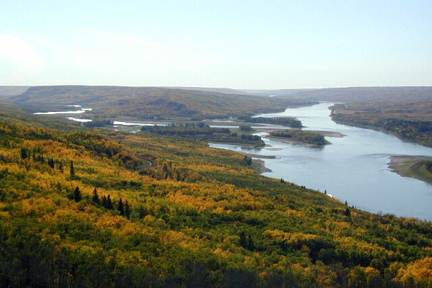 The landscapes of Peace River ar4e nothing short of stunning. I’ve talked before about how much it has influenced me both personally and as a writer (it really is one of the central characters in Evil on the Peace River), and so whenever something like this happens it wounds me. And it seems that lately, these things are happening more often. But yet we don’t seem to be doing a great deal to stop it. This week I set out with my grandchildren to enjoy some of the wilds of the Peace. It breaks my heart to think that the legacy we might be leaving them is that they might not have the opportunity to do the same with their grandchildren some day. So I wanted to take a moment for us all to stop and think about what our natural places mean to us. If you’ve ever been inspired by the view overlooking a valley, or the sun as climbs above the peaks of a hillside, remember that it is up to us all to preserve that beauty, to keep it safe. And next time you hear of a random spill in some place you’ve never heard of before, remember that it’s happened in someone’s backyard.